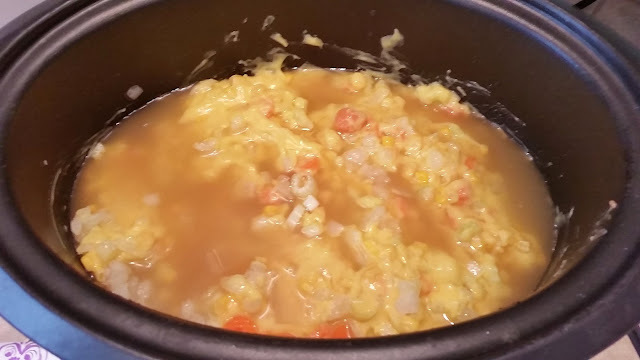 Need an easy family meal everyone will love? Well I have one that I wanted to pass it along. Not to mention it has a snappy name that just might make your kids want to eat it! 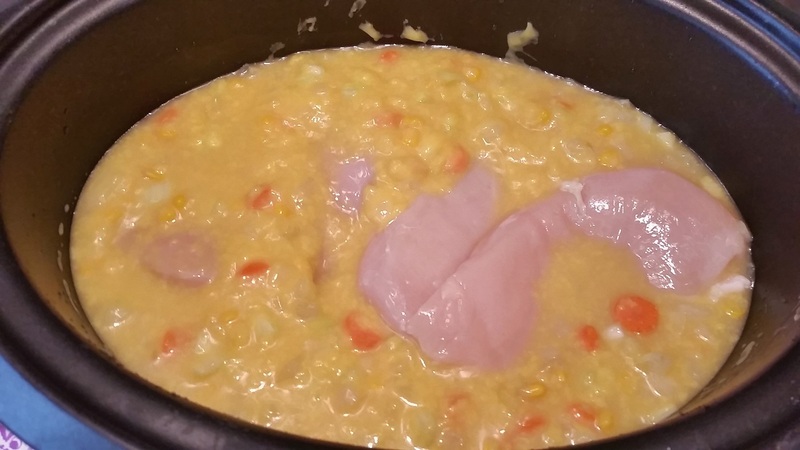 It started when a friend posted a picture on Facebook of a chicken n' dumpling recipe. It looked delicious, only I've never been a fan of how slimy biscuit dough can get when you cook it in a hot liquid. I mean, come on now, the BEST part of a biscuit is it's golden flaky brown crust, am I right? So if you're gonna have carbs, you might as well do them up right. 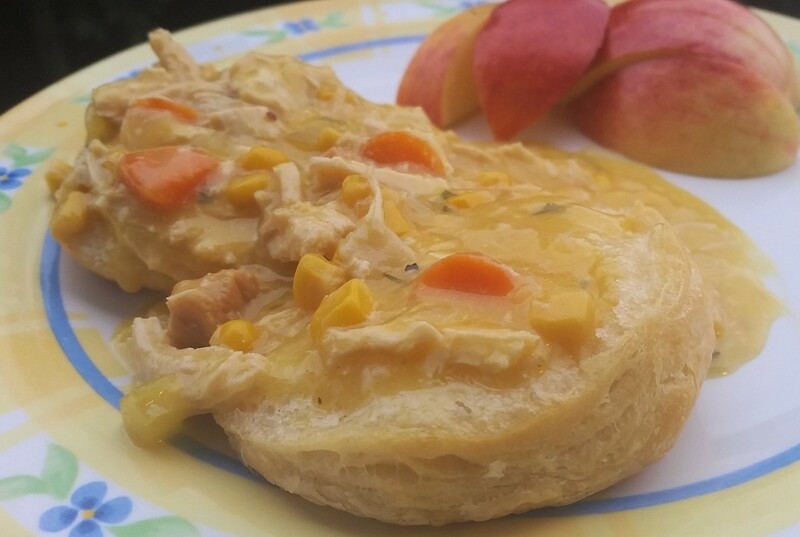 So I did some modifications of my own and came up with: Upside Down Chicken Pot Pie. Pour the large cream of chicken soup in chopped onion, celery, carrots and the can of corn in the bottom of the crock pot. 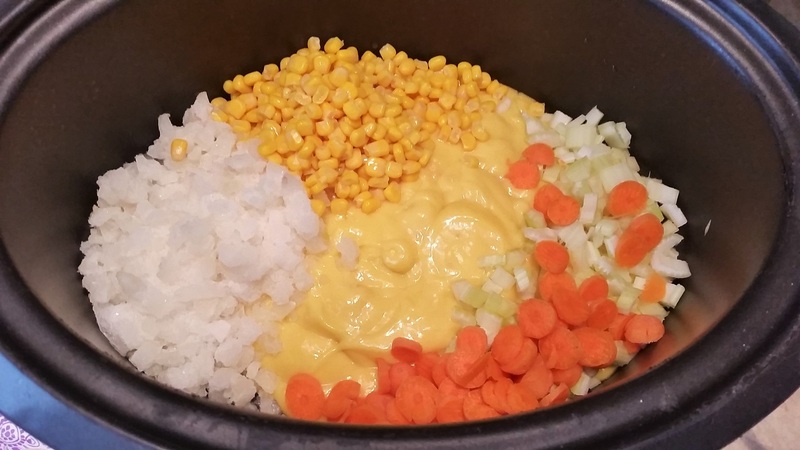 You can tailor the veggies to your liking. Add frozen peas the last hour of cooking if you wish. Drop in the chicken breasts and make sure they are covered in the "sauce"
Adding the chicken in. I pushed them down after this picture was taken. Cook on low in the crock pot for six hours. After six hours, pull chicken out of the pot and chop up into bite sized chunks on a plate. 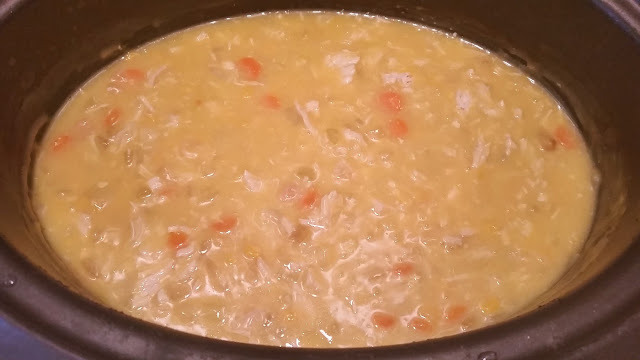 Add the chopped chicken back into the pot, stir, and let all the flavors meld and incorporate. Add salt, pepper, or dried parsley at this time. 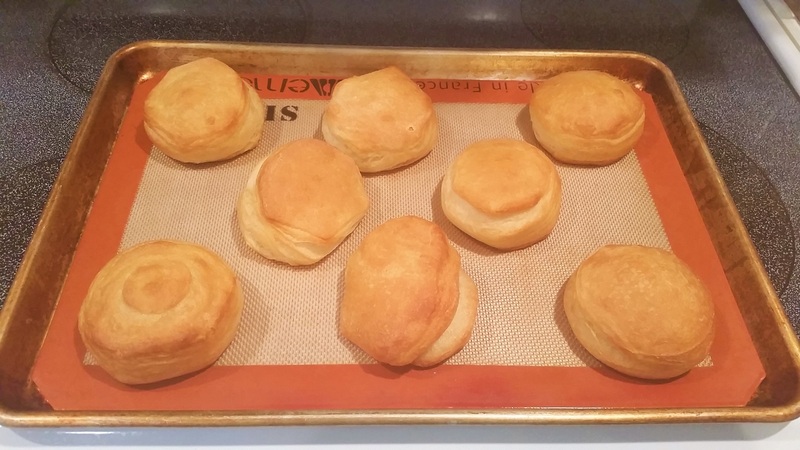 Now bake up a quick pan of your favorite biscuits until they are fluffy and golden brown. By now your house should smell like heaven. 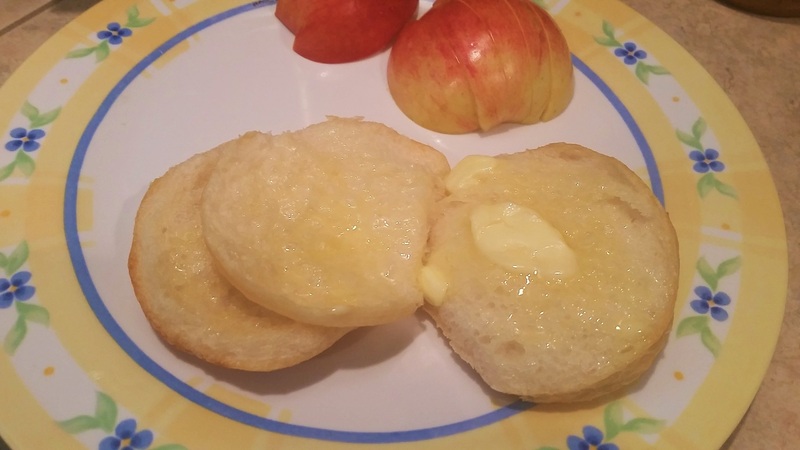 While the biscuits are still warm, split them open on a plate and top with a pat of butter. Mmmm melted butter on a hot bun. Hello comfort food. After that, lovingly spoon over a heapin' helpin' of the chicken pot pie mixture. Serve with fruit, a green salad, and you've got an easy winner winner chicken dinner. I'm not gonna lie here people. This was so so SO good. The kids ate it up. It made for great left overs too. I stored the extra pot pie filling by itself in microwave-safe container, and wrapped the biscuits separately. I sent hubby to work with an "upside down chicken pot pie" kit and he could heat and assemble at work at will. 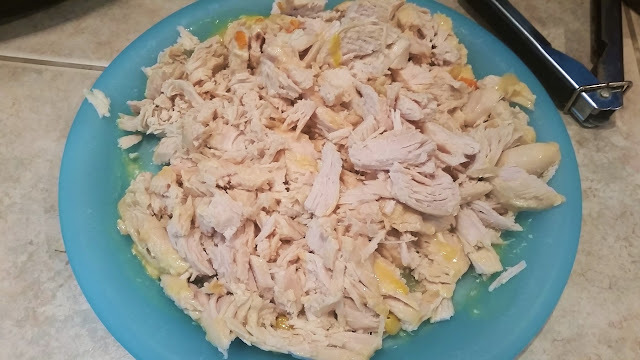 I was trying to figure out the differences between chicken n dumplings, chicken n' biscuits, and my new and improved upside down chicken pot pie. In my research to make the first two, I kept reading comments about the dumplings being "raw" or soggy in the middle. In the case of chicken n biscuits, (in which you cook the biscuit dough on top of the pot pie sauce), the number one complaint was soggy biscuit bottoms. Well have soggy bottoms no more! 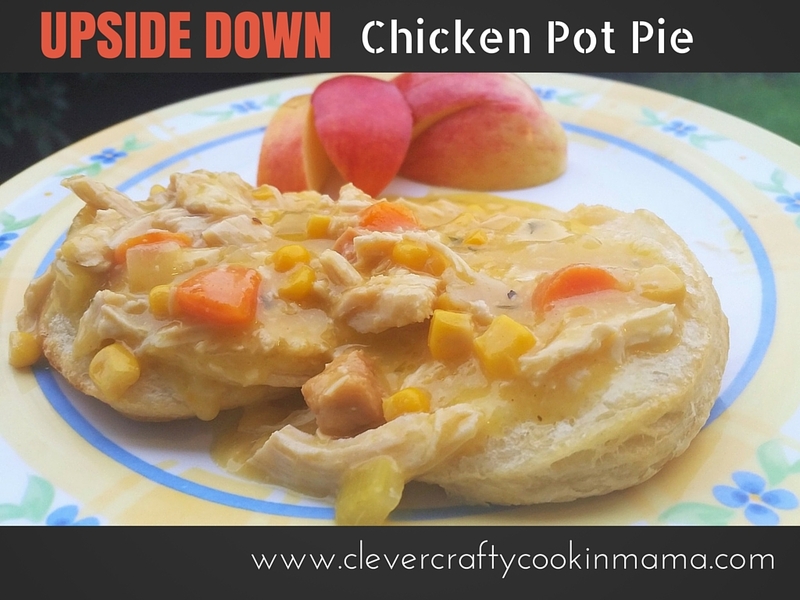 Upside down chicken pot pie... it's a win win for flavor town! 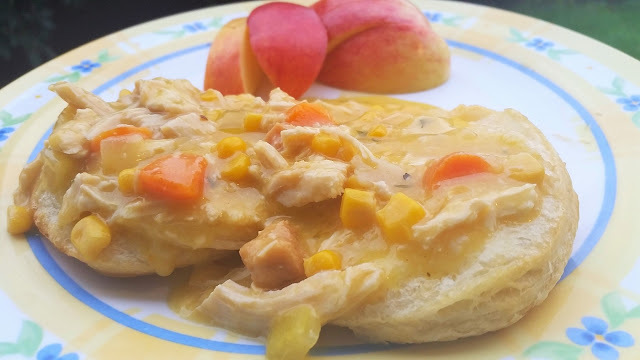 I think we've found the perfect solution on how to add those delicious, home-style chicken pot pie flavors, with those fully cooked golden buttery flaky biscuits that every one loves. All we had to do was flip everything upside down!! Full printable recipe can be found by clicking here.